In another sign that the U.S. economy has made a full recovery from the 2007-2009 recession, state and local tax collections reached a new record high in the fourth quarter 2010 of $378.3 billion, according to data released today by the Census Bureau. 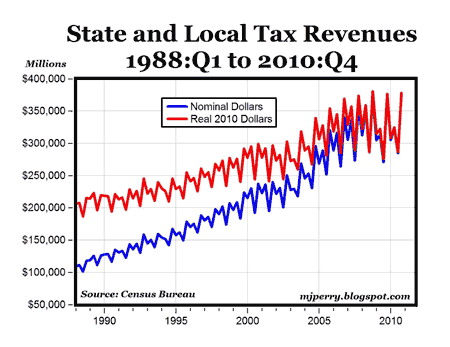 Compared to the fourth quarter of 2009, state tax collections were up overall by 1.64%, helped by increases of more than 10% for individual income taxes, 14.3% for corporate income taxes, and 2.3% for sales taxes. Property tax collections fell by almost 3% over the year, most likely due to falling home values. 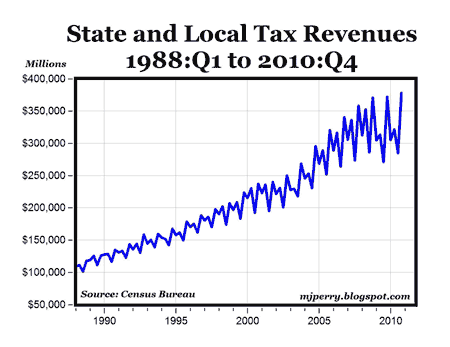 The rising tax revenues at the state and local levels to all-time record highs might suggest that the many states with budget deficits have a spending problem, not a revenue problem.